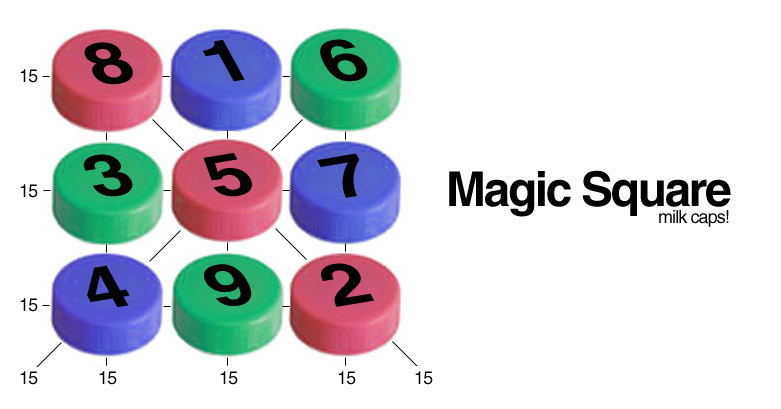 A Magic Square is a great tactile, thinking game for kids, that has them rearrange three numerals (horizontal, vertical, and diagonal) so they all equal one sum, a magical number! I was inspired by Love 2 Learn 2 Day's milk cap magic square, so I made my own! Kids love the use of milk caps because they can slide and glide them around on a flat table top. Magic Squares are also a good way for kids to improve their addition skills using a group of addends, three whole numbers in an equation.